My last post mentioned the effect two small changes in the 'submit your details' had on the average numbers of subscribers to our newsletter (and happy to say: still on 1 new reader per day!). We all know the standard 'webform' on so many websites and/or blogs to submit your name and email address to subscribe or to receive more information, perhaps you're using it yourself. AWeber (affiliate) can do much, much more for you - as I found out recently. Looking for a simpler way for our prospects to contact us in such a way we could start a proper conversation (and keep them informed about our products and services in one go) I first tried to 'send them' to a feature on our new webshop: Request more information. But the amount of information a prospect has to fill in straight away just to ask the simplest of questions I myself would find too much of an effort. If you are familiar with the AWeber software (if not, I strongly recommend you subscribe to a "test drive" - see below for link) you have recognised the way the above 'webform' is created. In the List Settings - Webform tab you create your own text to explain what the sumbitter will receive, add name and email field, edit the text in the submit button and presto: html coding ready for you to add to your website or blog. Simple. From choosing the type this specific field should be: radio-buttons, drop-down list, check box or even text area to making it a required field you can create your own survey form. Why not have a first look on Wood You Like's "Ask our professional advice" page to see how it can work. And it does work! Since implementing it on our website last weekend we already received five questions, which gives us the opportunity to answer the query very specific - tailor made in fact due to the information we received from the form, start a continues conversation with our new prospect and keep in monthly contact with them through our newsletter. How much more fun can webmarketing become? 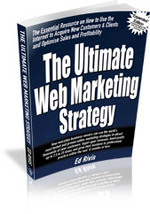 Last week I mentioned The Ultimate Web Marketing Strategy written by Ed Rivis and about to be available as hard-copy. 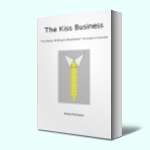 Ed's book (and blog) is filled with effective web marketing ideas anyone who has some knowledge of IT and/or web marketing software can implement straight away. Like I did with one of his tips (from his blog, even before I received the PDF-file of his book). 90% of our yearly turnover is generated from new clients, only 10% comes from existing clients (buying small extra items like maintenance products and very rarely - still - a whole new floor). That's the type of business, trade we are in: 'cos how many quality natural wooden floors do you need in a year - or in 5 years? Now, marketing statistics tell us that is takes 7 times more effort to find a new customer/client than keeping an existing one. The same statistics also tell us that on average you'll have to send around 7 - 10 marketing messages to a prospect before he/she turns into a customer/client. Being in a what I've started to call a "New Customer Only" trade means it is of utmost importance to reach as many prospects as you can and to start a conversation with them as soon as possible. Offering specific information is a way to do this, using an informative website. That's one message delivered. In order to be able to deliver a sequence of messages to a prospect you need their details: nowadays an email address is a good starter. Since last October our informative website has AWever webforms embedded on specific pages to do just that: we give you information in return of a small favour: you give us your name and email address so we can keep you informed with our monthly newsletter after we have emailed you the specific information you requested. 6 more prospects per week who have shown interest in our products and services and who we, by keeping the conversation alive with for them interesting and specific information, must try to convert into customers/clients. The odds of converting 1 out of 10 prospects is much easier when the number of prospects is growing. And all it took to increase this number of prospects were two small changes in the "subscribe to our newsletter" webform. The second change was to add a pop-over webform (only once per visitor - but on four different and popular pages - three of them also showing the normal static subscribe option). And as it turns out, the pop-over is responsible for the most new subscribers. Small changes, terrific results - now 'all' we have to do is keep them engaged in the conversation. One idea down - many more to go. Our - 5 year old - company Wood You Like Ltd prides itself on its high level of customer care. Everyone of our clients knows what they can expect from us from the start, we have webpages filled with (free) information to help them decide and select the best (for their circumstances, interior design wishes and their budget) products and or services we can supply. And our customer care doesn't stop the moment we've delivered or installed their floor, we don't 'close-the-door' on them (like one 'fellow' installer once told me he did). Our clients appreciate our care, and are happy to tell us so too. And to be honest, we don't get many complaints or negative remarks from our clients, but we are only human so of course it can happen. We're not afraid of that, of course not! We will always do our utmost best to remedy any issue our clients are not really happy with. How else can we create word-of-mouth? Because, as Andy Sernovitz so truly states in his book "Word Of Mouth Marketing: How Smart Companies Get People Talking ": Marketing is NOT about what you say, it is about what you DO! This week we received a (long) letter from one of our clients. We worked on a flooring, part renovation job for them last year. Four months ago! Their letter starts with a sweet remark on how they appreciate the enjoyable relationship they have (had?) with us, which made it somehow hard for them to put pen to paper to state a list with items/issues they're not happy with. And could we please contact them to remedy the situation? OF COURSE! VERY HAPPY TO DO SO! YESTERDAY IF POSSIBLE! "You recently purchased a natural wooden floor or service from us and we trust everything is to your liking and in good order. Please feel free to call us if you are in any doubt. Remember there is always a 4-seasons guarantee on our labour (if we installed the floor for you)." We cannot make it any clearer than that! Our clients waited 4 months to inform us of their doubts. And what frustrates me most is the ultimate reason they finally did so: more and more friends, family, neighbours remarked on their floor. 4 months of 'festering' doubt if we are the proper company we make out to be, 4 months of generating 'bad publicity' without us even knowing about it, 4 months without us being able to correct the situation if we've made mistakes - we are only human, we do make mistakes (not many fortunately but still, we do!). We will remedy this situation, no doubt about it and it doesn't matter if it is just a perception or indeed a case of having made mistakes, we will remedy this. Rather sooner than later! How do you stop clients NOT complaining?